Recently, I was invited to take part in the Cricket World Cup Food Recipe challenge for Betfair to celebrate the Cricket World Cup, which is taking place from now until the fifteenth of March. Fourteen nations are taking part including our home countries of England, Scotland and Ireland. You can take a look at the odds for the competing nations if you fancy a flutter, or just to see how they are doing as the Cricket World Cup progresses. We are quite big cricket fans in our house, and hubby always likes to invite friends over to watch the cricket as it progresses - especially if England are playing! Inspired by the participating nations, I took up the challenge of creating a recipe which is native to one of the nations taking part. Being a vegetarian and because of my love of Indian Vegetarian food, I decided to pick India as my chosen nation of choice. When we think of India, our mind is of course immediately drawn to curry, and I couldn't think of a better dish to celebrate the Cricket World Cup here in the UK during a dark and dreary winter than a good old Indian Curry! 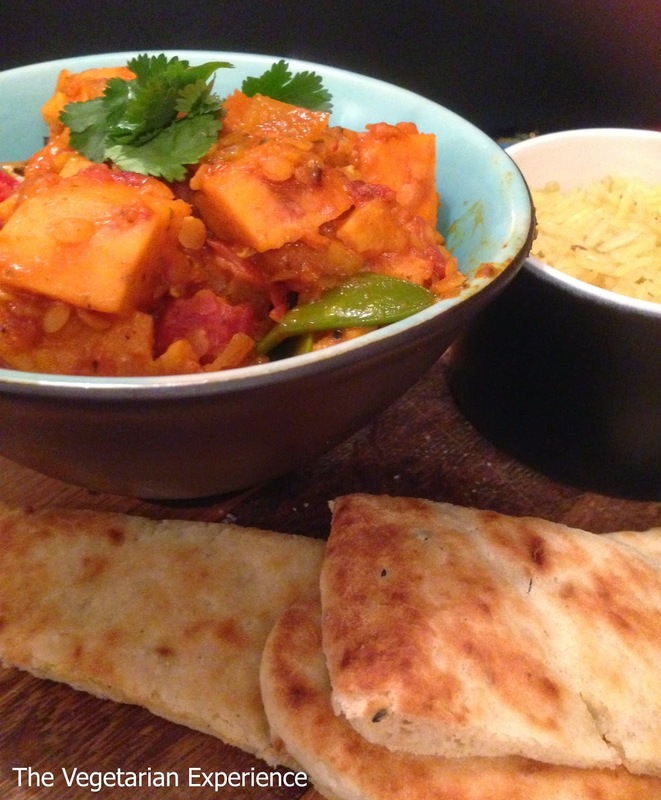 The good thing about a curry is that it is great for sharing and so I chose to make a Sweet Potato and Lentil Curry, which I feel would be perfect for a night in watching the Cricket - either on your own, with your partner or with friends. This curry is quite versatile - you can use whatever vegetables you like as long as you include the sweet potatoes and red lentils. We really enjoyed eating this curry - even the kids loved it! Do have a go of the recipe and let me know your thoughts! Rice and naan bread to serve. In a pan, fry the onion and pepper in some oil for around five minutes. Next, add the sweet potato and carrots and cook for a further five minutes. Add the red split lentils, chopped tomatoes and curry sauce. Simmer for 25-30 minutes or until the sweet potato and carrots are soft. Disclosure: This is a featured post. Betfair invited me to take part in the Cricket World Cup Recipe challenge.